Use this standard HDMI right angle adapter in tight or confined spaces to allow connection of an HDMI cable. Typical uses include wall-mounted TV's and cramped entertainment centers or equipment racks where there simply is not room for a cable to extend behind the equipment. These adapters can reduce space required for HDMI cable connections by changing the direction of the cable run. 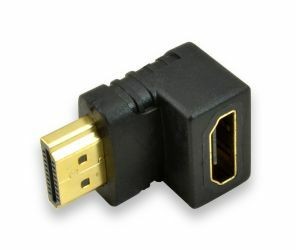 This right angle adapter features a standard HDMI Male connector on one end and a standard HDMI Female connector on the other end. It uses a standard 19-pin connection with gold-plated connectors. It supports 1080p, 1080i, 720p, and 720i resolutions.